The Realization of Emily Linder will have its World Premiere at New Jersey Repertory Company (NJ Rep) from April 23rd through May 24th. The play is written by Richard Strand and directed by the theatre’s Artistic Director, SuzAnne Barabas. In this comedic-drama, Emily, an eccentric retired university professor has come to the “realization” that she knows the exact day she will pass away. She gathers her two daughters to her side to inform them of her eminent demise and to give each explicit instructions and assignments to fulfill prior to her earthly departure. Marnie Andrews plays the lead role of Emily and Broadwayworld.com had the opportunity to interview her about her career and the show. 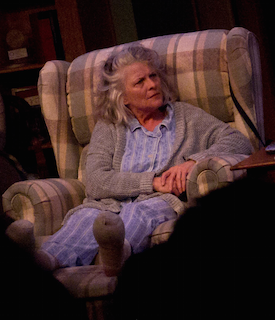 In over forty years of performing, Marnie Andrews played leading ladies (Camelot, The Killing of Sister George, The Glass Menagerie) and originated roles in new play premieres. Her screen work includes the recent Hits, (directed by David Cross, Sundance Film Festival 2014), Andrews has television credits that include ER, Murder One, Wonder Years, and recurring with Mark Harmon on Reasonable Doubts. Her Los Angeles work garnered both Dramalogue and Garland Awards. Marnie began developing new plays with Merely Players in the 1970’s, which launched the careers of Jose Rivera and Jeffrey Hatcher. As writer, she was awarded the Berrilla Kerr Playwrighting grant. She is a member of PLAYS IN PROGRESS, a collective in Hudson, NY. She collaborates with her photographer Jeff Jacobson on articles published internationally as well as multimedia pieces. Some highlights of thirty years as director are her Trojan Women, chosen by the Getty Museum in Los Angeles for an international audience of classical scholars and recent productions of The Mousetrap and Fifth of July, acclaimed by the American College Theatre Festival. What was your earliest interest in theater? My dad was a Methodist preacher, we moved every 3 years to another church. He also directed some high school plays. The parsonage was a glass house, we were ‘onstage’ even at home, when church members often dropped by to visit. We lived in small mill towns or farming communities, so I had little exposure to theatre. My dream was to travel the world singing. When I got to college, I thought I was too old-at age 17- to attempt to become an actor, so I began writing. Then I saw “Escurial” at UNC, returned to my campus, and told my advisor I had to be an actor. She set up auditions for performing arts scholarships, I got them, and never looked back. Though, I do continue to write. What performers and performances have inspired you? Jessica Tandy in “Foxfire.” Playing a 79 year-old character, she leapt into the air with a scarf dancing in her hand, and landed as a 16 year-old girl, recreating the moment she fell in love. Janet McTeer in “A Doll’s House.” Hers was a tall, strong Nora, a not timid, limp rendition. She had fire. Her passionate exchange with her husband that helped me understand why she was with him in the first place. James Earl Jones in “Fences.” The whole cast was a terrific ensemble with Mary Alice and Courtney B. Vance. I had met Mr. Jones years earlier, at the closing party for the baseball comedy “The Bingo Long Traveling All-Stars & Motor Kings.” He was gracious and warm. Seeing him again as a bitter, defeated man, seething with the memory that he couldn’t play Major League baseball, was strange irony, a great performance. Frances Sternhagen. She had a successful marriage, and six children, and still managed to maintain a brilliant career. What would you tell someone in the profession who wishes to have longevity in their career? No two actors have the same career. I was lucky, with acting jobs on camera and in voice-overs to support the theatre jobs, and writing jobs that allowed me to travel with my photographer/husband Jeff Jacobson, and our son Henry, a photographer and filmmaker. When I became a mother, I had to make a living in what I loved in order to do what I loved. Jeff made more money, and was away less, than I could do as a regional theatre actor. So, with a young child, I stopped travelling, worked from home in New York then in Los Angeles, doing on camera acting jobs, classical theatre to keep my chops up, and developing new plays for car fare. By staying put, I honed the work on new plays with the playwrights. Directing began during my time with the new play development company of Merely Players. I realized I was aging out roles I had hoped to play, (Juliet, for instance,) and wanted to continue to work, whatever my age. I was never aware I was building a long career as it was happening. I started to realize it by seeing my Screen Actors Guild pension in my bank account every month. Get a life, one that will give emotional support when times are lean or when you don’t get cast. Give yourself good reasons to do the business of Acting. Live simply. The acting business is complex. It entails sudden changes at the last minute. It is easier to change direction when unencumbered. Acting is much easier if the body is fit. Well, so is Life for that matter. Maintain suppleness. Have another project in mind before the current one finishes. It makes closing night less bittersweet. How is your role in The Realization different or similar to other roles you have played? The role of Emily is a modern, erudite mother, similar to Amanda in “The Glass Menagerie,” my last major role, in that she has a huge presence. But unlike Amanda, her circumstances cause her to be immobilized. Acting her requires a great deal of stillness, while animating that presence. Tell us a little about the cast and creative team at New Jersey Repertory Company. The members of this cast have long histories at NJ Rep. However, this is the first time we’ve done a show together. Dana Benningfield is a friend of long-standing. I am thrilled we are finally acting on the same stage. Corey Tazmania and I did readings together, which helped us know and respect each other. These parts, with Dana and Corey as my children, have a lot of fireworks as well as humor. Jenny Vallancourt is dynamic, I met her at the initial reading. Suzanne Barabas directed me before. She put this cast together, probably because she knew how much fun it would be. I finished directing “The Mousetrap” two weeks before we started rehearsing “The Realization of Emily Linder.” In the fall, I am directing three one-acts and teaching Voice and Acting as a guest director/teacher at the University at Albany. This summer, I hope for a little time at our home in the Catskills to garden, finish some neglected writing projects, clap eyes on my husband, and play with our dog.